On a hot, sweaty day nothing is more refreshing that a cool flute of Prosecco. Light, often slightly sweet with just a hint of citrus, Prosecco is Italy’s most famous sparkling wine. Made from grapes by the same name, Prosecco hails from the Veneto -- the region surrounding Venice. And given the sultry summer days that can descend on the Veneto, it is no surprise that they have developed a fine, light and refreshing sparkling wine – perfectly refreshing. Cousin to France’s champagne, Prosecco’s fermentation process requires less fuss. Bottles don’t have to be turned twice each day, and the wine is fermented in steel casks. In wine speak, Prosecco is a “young wine.” It is intended to be enjoyed soon after bottling. 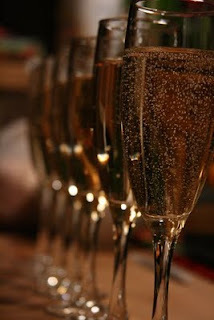 In fact, keeping Prosecco for a long time will diminish the flavors. This in turn means that Prosecco can be a less-expensive pleasure. But make no mistake: Prosecco is a pleasure! It is often enjoyed as an aperitif before a meal, but with a light dessert or a lovely bowl of fruit, Prosecco closes a meal beautifully. Harry’s Bar, the Venetian landmark made famous by Ernest Hemingway and Charlie Chaplin, uses Prosecco in their signature drink: the Bellini. A traditional Bellini mixes white peach puree with Prosecco and is served in a champagne flute. However, I’ve developed my own twist on a Bellini, which is a perfect cocktail or dessert on a hot summer evening. * Click on the links to see which appliances I use. Combine the peaches and sugar in a blender. If the peaches are still frozen, add 1/4-1/2 c. water. Puree until smooth. Taste the mixture and adjust the sweetness as desired. You’ll need far less sugar and no water with fresh peaches, depending on how ripe they are. Pour the peach mixture into the bowl of an ice cream maker and start the freezing process according to the manufacturer’s recommendations. This can be done a day or two in advance. In a double old-fashioned glass, put a scoop of the frozen peach mixture in the bottom of the glass. Cover with Prosecco. Enjoy! Note: You could also buy peach sorbet for this recipe, though it can be hard to find. Using frozen peaches makes this a really fast recipe. Fresh peaches take much longer to freeze. we're abt to make peach ice cream - adding it to a little prosecco would be delicious. thanks! Maybe the prosecco could just go in with the sorbet like champage sorbet - only serve to grown-ups! Mmmm, prosecco. One of my absolute favorites. I love the bellini idea. This sounds perfectly refreshing as a summer drink. I don't drink very often but when I do it's generally white wine or Prosecco - it's fun to learn a little about how it's made.